Some weekends I feel like I am stuffing too much into 2 days and by Sunday afternoon I am exhausted. This weekend I am coming off a high of sorts. I had so much fun and even though it did tire me out, it was a different type of tired. On Saturday my mom had a birthday and she wanted to go ziplining. Now a little back story. Me and my mom went ziplining in Montana a few years ago and we both loved it. When I asked her what she wanted to do this year for her birthday and she said ziplining, it didn't completely surprise me. 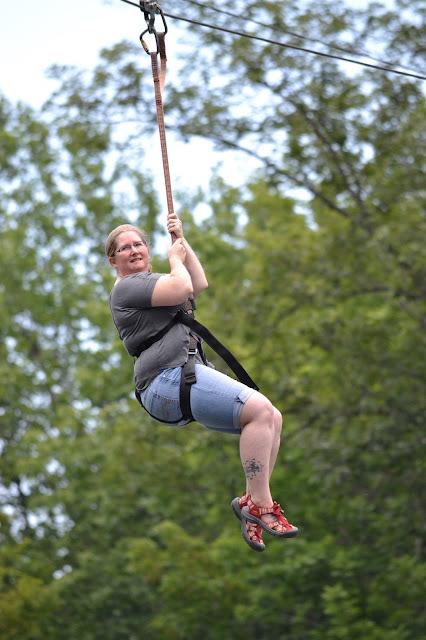 We went to Camelback Mountain Adventures in Pennsylvania. It was a little over an hour drive from my parents house, so it was the best option for us. We got there around 4pm and we were able to zipline twice and the weather was excellent. Camelback was amazing and the staff was super helpful! I recommend it if you are looking for some adventure and are in the area! My first ride was so freeing. I felt like I could leave behind any stress I had as I soared through the air. My landing was not so graceful, but that's okay. No one got hurt and that's all that matters. My mom went down before me and she had a blast. 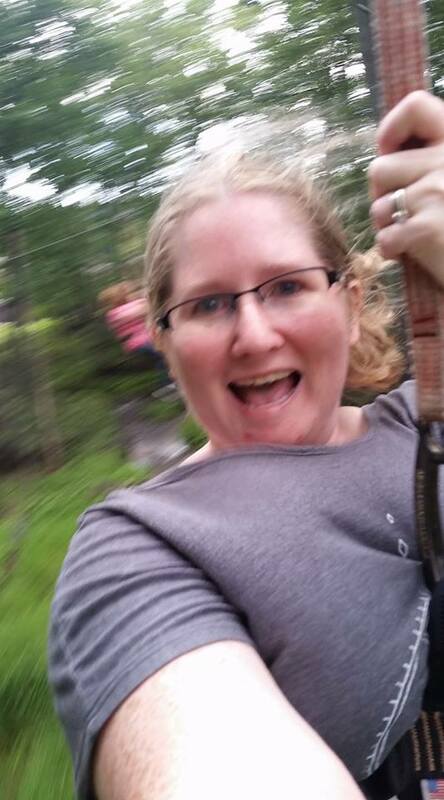 On my second ride down I wanted to take video of my mom ziplining down. I had my phone aimed at her and at the end I realized I messed up the video and did not get the video I wanted, but I ended up getting this random photo of my self. Although I am sad I didn't get video for my mom, I am so excited that I got this one by complete accident. My mom is zooming down in the background. She may be a blur, but she did it and she has proof of her own. She got a great photo too. I have to admit, I get so wrapped up in everyday life that I forgot that you can have fun at any age. Age doesn't define you. If you want to have fun, have fun. Jump off the platform. Soar through the air and just let go!